The people and organizations that make change happen. Kayse Jama was born in Somalia into a nomadic family. He lived the nomad life until his older brother, who worked in the Education Ministry, brought him and one of his brothers to Mogadishu to live with him so they could get a formal education. Jama was eight, with the confidence engendered by his tribal culture, but still an outsider in the urban school environment. Even at eight, he knew the organizing strategy of turning the negative into a positive and turned his difference into a leadership role in school, chosen to lead the class while they waited for a teacher to come and, later, to lead the class poetry lessons, a skill enhanced by the oral tradition of tribal life. His first deliberate political act was when he was in eleventh grade, leading a delegation of students to the Minister of Education’s office to demand more resources for the schools, schools who were losing teachers and resources to the civil war that was consuming the country–a tribal conflict over resources that was repeated throughout the developing world as colonial empires receded leaving behind artificial borders and governments. This was a bold act in a dictatorship. Before long, the civil war consumed the country and Jama, like many of his compatriots, fled seeking refuge abroad, eventually coming to the United States. It was here where Jama came to understand the systemic nature of oppression in the US context. While he understood well the systemic oppression of hierarchical tribal conflicts that divided his country, in the US these oppressions were linked to historical injustices different than his own experience. Certainly, he was aware of gender oppression, but when he arrived in the United States as a poor, black refugee, the full weight of these interwoven oppressions landed on him. He was soon was back to his natural mode–organizing. He began working with African refugees for a local social service agency organizing after school programs for refugee students. He became focused on organizing full-time after 9/11, working to support immigrants and refugees who were being targeted in reaction to the attack. Women in particular faced hostility as many wear the hijab, making their faith visible in ways men do not. He co-founded the Community Language and Culture Bank which soon emerged as the Center for Intercultural Organizing and came to focus their efforts on education, civic engagement, community mobilization and leadership development. Recently the Center for Intercultural Organizing merged with Oregon Action to form a broader, stronger organization, Unite Oregon which has taken the lead in opposing Trump’s immigration ban, filing suit against the immigration ban and in pressuring state and local government to expand their efforts to protect Oregon’s immigrants. Unite Oregon is also putting a lot of effort into small, culturally-specific gatherings so that immigrants and refugees feel more comfortable about asking questions and role-playing situations where they are confronted by Immigration and Customs Enforcement agents.When Jama came to America, his foundations shaken by his experiences, his natural instinct was to organize. When Jama came to America, his natural instinct was to organize. “Finding myself poor, black, and a refugee, that shook my system. So what I know best, how do you convert the things that are bothering you in your life? How do you work to change those? How do you do things different, how do you change? It became part of my survival. I never said ‘I want to study organizing, I want to be an organizer.’ It just became a survival mechanism…It became my natural instinct.” Oregon and the United States are better for it. What are your organizing priorities now? Where do I start? In short, the most important thing is to protect people from the current administration. This means protecting the immigrant community, refugees, low income people, communities of color from the policy attacks coming from Trump. Then, of course, we need to make progress on the issues that have been impacting us for a long time: disinvestment from poor communities, structural racism, economic justice, and immigrant and refugee rights. We have to propose local solutions to the problems people face. While we are dealing with the immediate needs of the community, we need to focus and highlight local solutions that help the community to move forward and try and bridge the urban and rural divide. Addressing local solutions, working with other organizations, whether state, county, or local, that is Unite Oregon’s agenda. Martin Luther King, Jr. said “The arc of the moral universe is long, but it bends toward justice.” Do you believe that? If I didn’t believe that, I would not be an organizer. I absolutely believe we will get there someday. If you look at the history of this country, many of the things we now take for granted were not even possible one hundred or two hundred years ago. It would be impossible for you if you were black, Native American, or a woman. We have made significant progress. We have a lot to do, but it shows we will ultimately bend toward justice. We just have to do the hard work, do the collective organizing, move a shared vision forward and we will get there. The question for me is not whether we will get there, but how long it will take us. With the best strategy and the best organizing we can shorten the time. It’s about when, it’s not about if. People, humanity. I have a lot of faith in humanity. Ultimately, I believe there are a lot of wonderful people in this world, working hard, trying to do the right thing. Every day I work with incredible human beings, even in my little office, who have dedicated their lives to make sure we have a just world. Those folks give me hope. My children and my family give me hope. My children and my family give me hope also. Their understanding of the world helps me to see the possibilities. There’s hope because they understand the world better that I did at their age, differently than most. Is there a difference between organizing and activism? Absolutely. Activism is doing activities. People can be active and can do many different things, but organizing is about having a strategy and working for an ultimate goal, an end result. You have your strategies, goals, objectives, you’re working for an end game. There is, in the end, change, an end result when you organize. Activism is being involved, not necessarily connected to a strategy. People keep saying we need to show solidarity with people who will be targets of the new regime. How do you define solidarity? How do we show solidarity? I am a true believer that people who are affected by an issue must take a leadership role in solving those issues. That takes me to solidarity. Those people who want to be in solidarity with other people have to be okay with being led by the people who are affected. That does not mean they cannot take any leadership role, but only with the understanding the nuance of who is impacted by the issue and their role in leading on the issue. For me, solidarity is you are willing to take your lead from the people who are affected, understanding your role is more than empathy and sympathy—that you want to be part of a movement. You also understand the roles different people play and your role as someone in solidarity. Solidarity is letting the people affected take charge as Jama is doing in supporting his wife, Stephanie Stephens, campaign for David Douglas School Board. For example, one of the few privileges I have is I am male. I cannot understand what it means to be a woman. I can be in solidarity with the women’s movement and follow the lead of those who have that experience on that issue. That’s the difference between someone using the word solidarity in broad terms to claim solidarity with refugee movement, solidarity with women’s movement, with the LGBTQ movement and someone who understands how power plays out. Another word being used quite a bit is ally? What is an ally? Some anti-racist activists say they need fewer allies and more accomplices? What do you think they mean? The word ally has been overused. I understand the concept. If you are not a person of color, you cannot understand what it is like to be a person of color because you do not have that direct experience. But if you have that understanding of and want to support racial justice, you can be seen as an ally, but you must make sure people of color are taking the lead. Karl Popper has argued that tolerating the intolerant inevitably leads to an intolerant society. On the other hand, John Milton says truth will always defeat error if speech is unrestricted and free. Where do you find yourself? The question I have is whether harm has been done. Let’s say someone’s freedom of speech is used to harm another person, to oppress another person. If they harm someone, it is their individual responsibility. I fundamentally believe in freedom of speech; that it must be guaranteed, though it has been used to oppress. One’s freedom must not not harm another person. The impact is what is important to me. What is your response to those who say we must reduce the emphasis on human rights organizing (identity politics) in electoral campaigns to win support from white working class voters? To be honest, I have an issue with the phrase “identity politics.” It is a way of minimizing the racial justice work we need to do. I have an issue with the way it has been framed. What I do believe, given our history, we cannot afford to ignore racial justice issues and oppression in the United States. Racial justice has to be the cornerstone of all our work. If you want to minimize that, you can call that “identity politics” but I call that racial justice. Justice to me means a few things. One, the absence of oppression. In addition to that it means that people are living to their highest potential in any circumstance, economically, socially, racially. It is not just the absence of oppression, but the ability for all people to thrive. What kind of world do you want to leave for the next generation, or, to put it another way, imagine the world in 30 years, what do you hope it will be like? I am hoping to leave the world a better place for my children. That is my ultimate hope. I am hoping the world will have less oppression. I don’t believe we can eliminate all the issues, but I am hoping when I leave there is less oppression of any kind in the world. What can we do to achieve that vision? I think my challenge is that right now we are experiencing an insurgency of activism. I don’t yet call it organizing. There’s a lot of people who are suddenly awakened and want to be active, but they are not at the point of being organizers or organized. We need an organizing movement with a core strategy, tactics, and agenda, working toward a common goal. If we are able to absorb those new folks and help them to be better organizers, as part of the movement, then we can shorten the timeline. That is my hope for achieving that vision. Without organizing, we will have a hard time achieving that vision. The Stephens-Jama Family with David Douglas School Board candidate Stephanie Stephens, Kayse Jama, and twins Sahan and Saharla. Photo courtesy of Kayse Jama. Self-care is part of resistance. How do you take care of yourself? I think you have to define self-care. I’m joking because I am not good at it. I tend to work long hours which is contrary to what everyone is teaching. We need to be here for the long haul, but there is so much to be done. I just can’t help to do it. But when I can, I spend time with my family and my friends. What do you want people to know about organizing? I think we all can be organizers. No matter our profession, whether a doctor or a nurse or a teacher, we can make space where we can all be organizers to achieve justice for our communities. My hope is people do not leave it all up to paid organizers. Even people with 9 to 5 jobs can be considered organizers and part of this movement. I hope we demystify organizing so that people see they can be organizers, too. So it becomes a lifestyle. Where do you go for news and information? I am bicultural, so I look at multiple sources for the news. I check in on my Somali news, there are many web sites with local and international Somali-language reporters that I trust. Then I check Huffington Post, New York Times, and Washington Post, mainstream American media. Then of course, Facebook. In the evening, I check MSNBC and CNN if I have time. 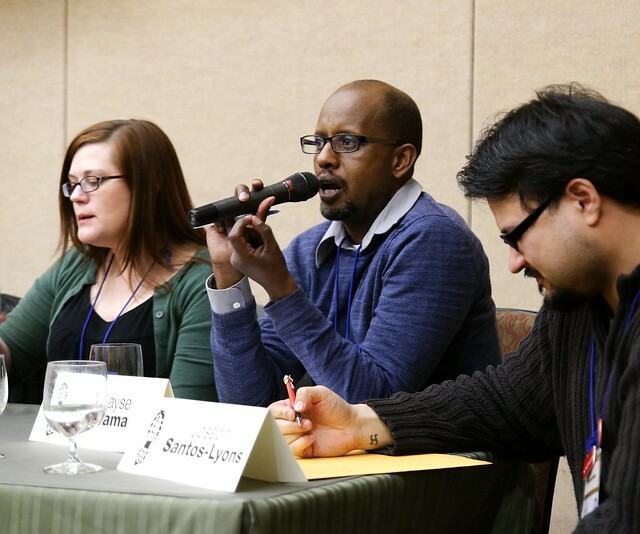 Kayse Jama, in addition to founding the Center for Intercultural Organizing in 2003, has worked forWestern States Center under the auspices of the New Voices Fellowship, training immigrant and refugee community leaders in Oregon, Washington, Nevada, Utah and Idaho. 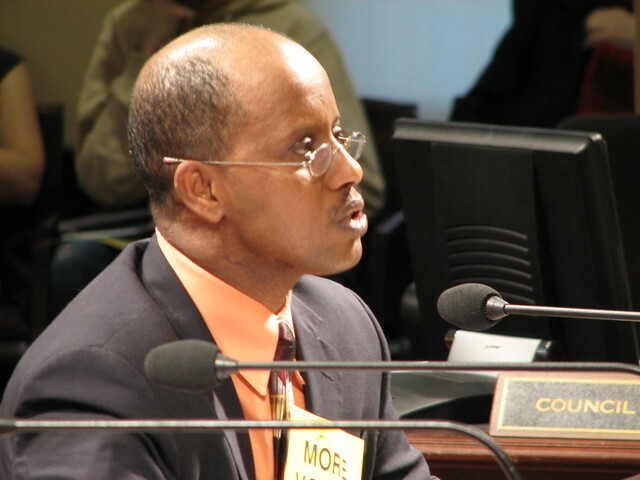 In 2007 he was awarded the Skidmore Prize.the Oregon chapter of the American Immigrant Lawyers Association honored him with the Oregon Immigrant Achievement Award. In 2009, he was presented theLowenstein Trust Award, which is presented yearly to “that person who demonstrated the greatest contribution to assisting the poor and underprivileged in Portland,” In 2012, he received the Portland Peace Prize. This entry was posted in Anti-Racism, Human Rights, Immigrant Rights and tagged American Immigrant Lawyers Association, American Immigrant Lawyers Association-Oregon Chapter, Aspen Institute, Lowenstein Trust, New Voices Fellowship, Portland Peace Prize, Skidmore Prize, Unite Oregon, Western States Center on April 10, 2017 by RuthAlice Anderson.